Jennifer has written an amazing and beautiful book where she introduces us to a lovely angel named 'Margaret,' who creates a special and safe place for people to come and share their stories. Jennifer Morgan’s ‘Come to the Garden’ is an absolute, must read. Its storyline is not only gripping and compelling, but truly inspiring as well. A retelling of ‘A Christmas Carol’ with a little bit more of an inspirational slant. Wonderful, delightful story for all ages. I just love these types of stories. Jennifer Wilder Morgan is an exceedingly creative writer. With sanctified imagination she opens a window into God's love and provision. 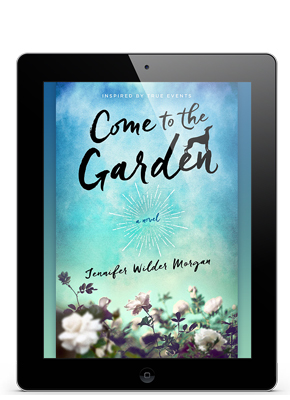 'Come to the Garden’ by Jennifer Wilder Morgan is more than a book about angels - it is a collection of stories that reinforce hope. The stories serve as a gateway to bring forth a silver lining during dim times in life. This book edified my soul and I know it will edify yours. Not only was the story amazing, but Jennifer's writing style impressed me deeply. This unconventional and charming narrative will strike deep into the hearts of anyone seeking a greater understanding of God. Some years ago, as a spiritual director, I quickly realized that I was sitting in the presence of a woman specially gifted with living in a thin place, where the veil between the here and the not-here trembles with anticipation of new encounters with the Divine. What a blessing Come to the Garden was right from the start! It is a reminder of how God is waiting for us to use the gifts He gives us to transform the lives of others. Jennifer’s authenticity and fresh style, combined with Kathie Lee’s superb narration performance, will captivate readers and cause many to explore their own pathway to God’s presence. I soon felt a burning need to put aside everything else I was reading and devour this amazing book that chronicles a uniquely gifted woman’s lifelong spiritual journey. Ms. Morgan offers the reader an in-depth look into a rare and fascinating faith journey. I was hooked from the first page. You cannot help but be drawn into the intimacy of the setting as Jennifer shares her experiences with listening to God’s voice with the wise, funny, coffee-loving angel.